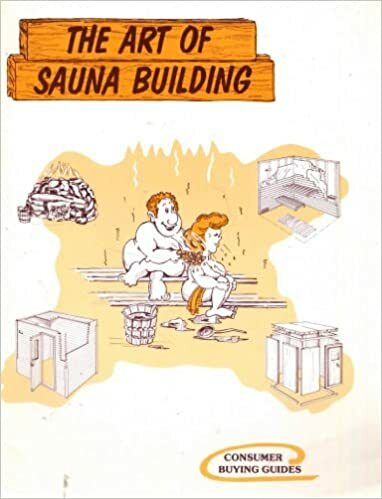 The standard sauna door size is 24" x 72" for a rough opening of 26" x 75". An air space of 5/8" to 1" is best under the door to allow for a proper air intake. Sauna doors are made shorter to reduce heat loss. 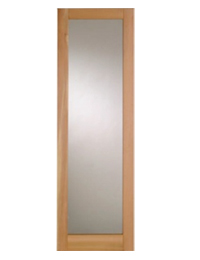 Sauna door sizes 24" x 76", 24" x 78" and 24" x 80" are optional, see pricing below. Custom door sizes - are available, just talk to us - we are the factory. ... $569 ... #1 Full Window Cedar Sauna Door ... "No-fog Glass"
$569 ... #1 Door Only, 24"x72", Full-window, with "No-fog Glass"
#1 Door Size: Standard 24" x 72" for rough opening 26" x 75"
#1-78 Door Size: Optional 24" x 78". Add $189. Just ask us for descriptions. 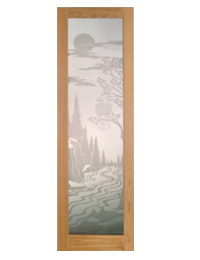 Door Size: 24" x 76" for Rough Opening 26" x 78"
The image above shows the #6-76 Sauna Door; the door frame package is shown beside the door. Bronze-tinted glass is "No-fog Glass"
#7-72 Door Size: 24" x 72" for rough opening 26" x 75" - allows 2x6 threshold under door. The tinted glass has an etched sauna motif in the center. #8-72 Door Size: 24" x 72" for rough opening 26" x 75" - allows 2x6 threshold under door. #9-76 Door Size: 24" x 76" for Rough Opening 26" x 78" - No 2x6 threshold under door - it is not needed. Door Size: 24" x 72" for Rough Opening 26" x 75". Spacing allows 2x6 thresh hold under door. Optional door size: 24" x 80" (add $199). Optional door size: 24" x 78" (add $199). Optional door size: 24" x 75" (add $199). Optional door size: 34" x 72" (add $299). Door hardware, door jamb, 2x6 threshold, door casing and door stop are sold separately $249 (not door #2). Door sill or threshold is available in 2x6 for $36. The thresh hold raises the door by 1.5" for a higher door opening and no one stubs their toe on the duckboard floor walking in. Door frame (jamb) width is 5.25". Material is clear grade Western Red Cedar 1x6 to match the sauna room. Sauna window units are available for sauna walls. Includes window frame of 1x6 clear grade cedar and 1 casing set for inside. Glass Size 20"x12", R/Opening 23.25" x 15.25", Bronzed Glass ... ... $249. Sauna doors in Canada can be shipped at the cost shown above.